I am a newbie at pressure cooking, and got a 6 qt. Fagor for my birthday from my daughters. Our first attempt was beef stew, and it came out delicious, but we had an issue with the pressure release. The recipe called for a quick release, and when we opened it to Steam, out whooshed lots of the red beef stew liquid with it. It was a mess! I closed it, and eventually opened it just a bit to let it out very slowly, but still experienced some of the stew base coming out with it. Did I do something wrong? Hi Rosemary – you didn’t do anything wrong. The recipe was wrong to tell you to quick release the stew. Most soups and stews need at least 5 minutes to stop the rapid boiling before you release the pressure, so that you don’t get liquid coming out of the valve. Hi Robert – I haven’t done a lot of fish because I’m allergic, but I do have one fish recipe in my new cookbook. A 1-inch thick piece of cod with an 8 minute cook time on a steamer about water. What would you recommend, instant pot or power pressure cooker XL? Which is better in your opinion Barbara? 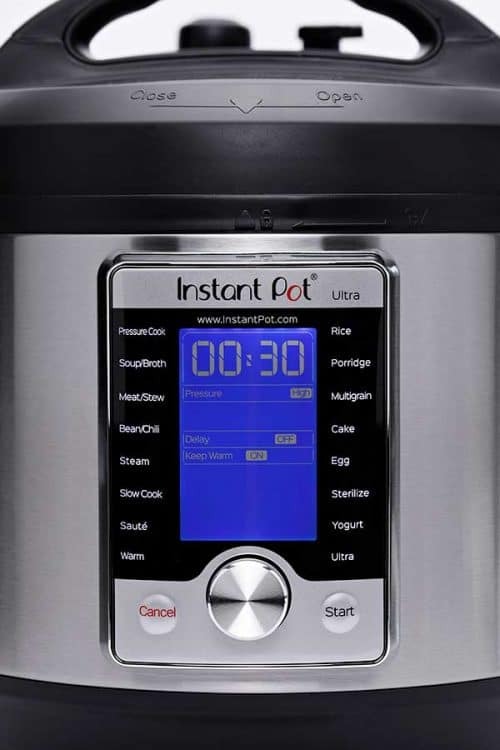 Hi Cindy – I prefer the Instant Pot because of the stainless steel pot and the ease of adjusting the time. The Instant Pot also cooks at a higher psi. Typically there are some good Black Friday sales on the Instant Pot. Hi Betsy – if you want to make small quantities the Mini will work great for beans, quinoa and risotto. If however, you plan to make a big batch of beans to freeze or use for several meals, you’d probably prefer the 6 quart. I have the Duo Mini and I love it! I make black bean soup, and steamed potatoes all the time. I personally can’t imagine having the bigger one, it would be way too big for myself, and my teenage son (and my kitchen!). You can totally make beans with the mini. I like to steam a few potatoes, wrap up the extra ones and put them in the fridge so I can pop them in the toaster oven later (only takes about 5-10 mins to get the skins crispy). For the black bean soup, I use a cup of Bob’s Red Mill BB soup mix, add a bunch of veggies & tomatoes and about a Tbsp Better Than Bullion, fill it just so everything is just about covered with water (about half way) and cook for 30 mins (manual – natural release). I haven’t done *solely* beans yet, but I cannot see why you couldn’t. ….We are also vegan/vegetarian here, too 🙂 – Cheers! Thanks so much for sharing Alysia! That’s a nice compliment – thanks! I’ve asked my daughters to buy me an Insta Pot for my birthday gift, but I have to decide between the 6-8 qt models. I decided I’d come to you, Barbara, for a little guidance here. My children are grown, and have their own homes, so there is just my husband and myself. I do have frequent dinners at our house, and I also like to prepare soups, and other dishes that I can eat one, and then freeze single meal portions for those nights when I’m not wanting to cook. Is there any wisdom you can offer me? Thank you. Can a whole chicken be cooked in the 6 at Insta Pot? And, does a chicken cooked this way stay moist? Yes, as long as it fits easily. This is a popular recipe http://healinggourmet.com/healthy-recipes/pressure-cooker-chicken/. They chicken is very moist and fall apart tender. 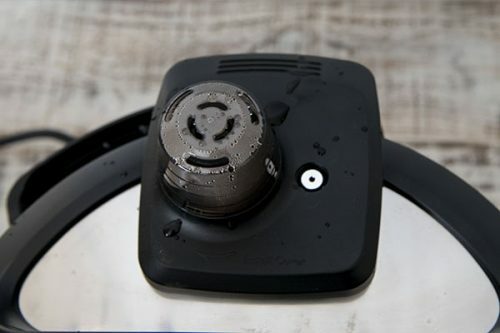 I spent some years in the Caribbean where pressure cookers have an old fashioned cap that sits on top of the valve. 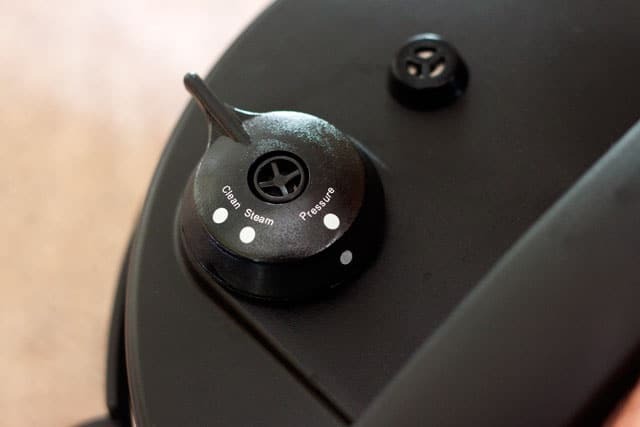 To quick release ladies put the pot under running cold water for a minute or two then remove the cap and with no steam being released open the cooker. Ok, I jst received my 10quart Power Pressure Cooker XL. Just wondering if the NPR valve is supposed to be loose when in the closed position and is there supposed to be steam coming out? 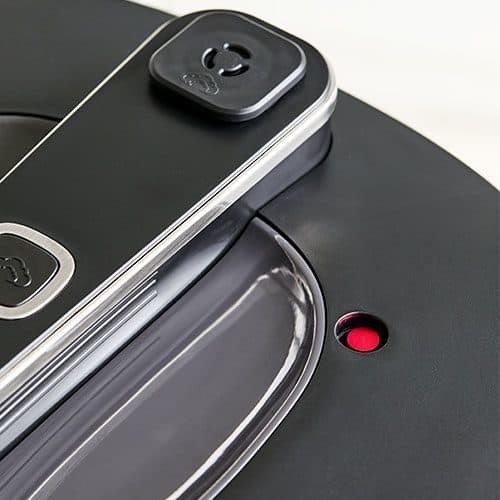 Hi Crystal – yes, the valve fits loosely and there will be steam coming out while it’s coming to pressure but very little should be coming out when it’s actually pressure cooking. First meal is pot roast and I had to check on NPR that was a term in the recipe. Thank you!!! Thank you for this! It makes total sense! Exactly the post I was looking for since you address the Keep Warm option and Instant Pot’s own information doesn’t really seem to. How do you modify the time when cooking larger amounts of food than the recipe? For example, I have a recipe for cooking 2 pounds of chicken thighs (9 minutes), but I want to cook 4 pounds. I understand that it will take longer, but wonder if there is a better way than trial and error to estimate the cooking time. Hi Rebecca – typically unless I’m increasing the liquid in a recipe, I don’t change the cook time when increasing the volume of the meat. If the meat is thicker, then you’ll definitely need a longer cook time. What pressure cooker is a good one to get? I’ve been looking at them. I seriously have know idea what to buy? Hi Judy – you can quick release if you are worried about overcooking some of the vegetables in the soup, but if soup starts to come out of the valve. close it and wait for a minute or two. Then try again, opening and closing it intermittently as needed. But if you’re not worried about overcooking ingredients, then it’s best to let the soup natural release for at least a short while so you don’t have any problems with the soup boiling up out of the valve. I do have a question that I can’t seem to find an answer to: Normally, when cooking pasta dishes, there’s the risk of pasta turning to mush if the pressure is not released right after cooking has finished. I’d love to find a way to make use of the Keep Warm function for pasta dishes when we’re away until just before dinner. Which would mean somehow working the natural release time into the cooking time. Would it work to cook a pasta dish for the same amount of minutes (half of what the package says) but use the low pressure manual setting and natural pressure release? Thank you and Happy New Year from Germany! Tried to make this tonight in the instant pot but I feel like it came out kind of watery.i I did the natural release. Should there be any water left when it’s done? Hi Aparna – I’m not sure what you were trying to make? This was so helpful and exactly the blog post I was looking for as a brand new Instant Pot owner & operator! I am making soup with veggies and rice in it and not sure how to set the dial…. I have it set to “slow cook” option on my electric pressure cooker. But what do I put the top setting on? Is it on “steam” or is it on “pressure”? I’m sure there will be a major difference in the way my soup turns out depending on which option I choose! Hi Charles – what pressure cooker are you using? Do you want to slow cook the soup or pressure cook the soup? I am using a Favor Electric Pressure Cooker. I want to slow cook the soup. I already have put the lower setting on “Slow Cook”. I don’t know which one to choose in order to slow cook some veggie soup I’m making. I’m sorry, I’m not familiar with the Favor electric pressure cooker. Are you sure you have to use one of the upper dial buttons? None of them make sense with slow cooking the soup. I’m guessing if I put the upper dial on “pressure” instead of “steam” the soup will cook much faster, even though I clicked on the “slow cook” button on the main front menu. I see what you mean now, you’re talking about the pressure release knob on the lid. 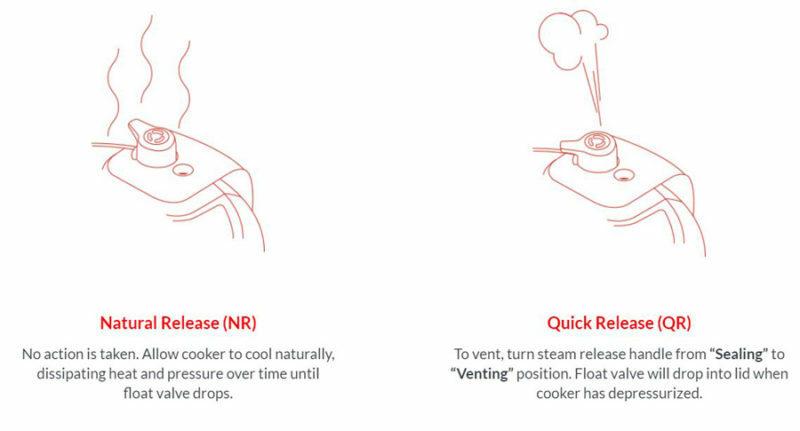 http://www.pressurecookingtoday.com/quick-pressure-release-or-natural-pressure-release/ When you are slow cooking you can cook with the valve closed – the pressure position (sealed), if you want to have less evaporation. Or if you want to lose some of the liquid as it cooks, you can have it in the steam position – which you use to release the pressure. It won’t affect the time it takes to cook. The clean position is to remove the knob for cleaning. Thanks so much, Barbara. I was afraid if I closed the valve to “pressure” that the slow cook would then “fast” cook. Your explanation that it’s only to control water evaporation is perfect! Thanks again. 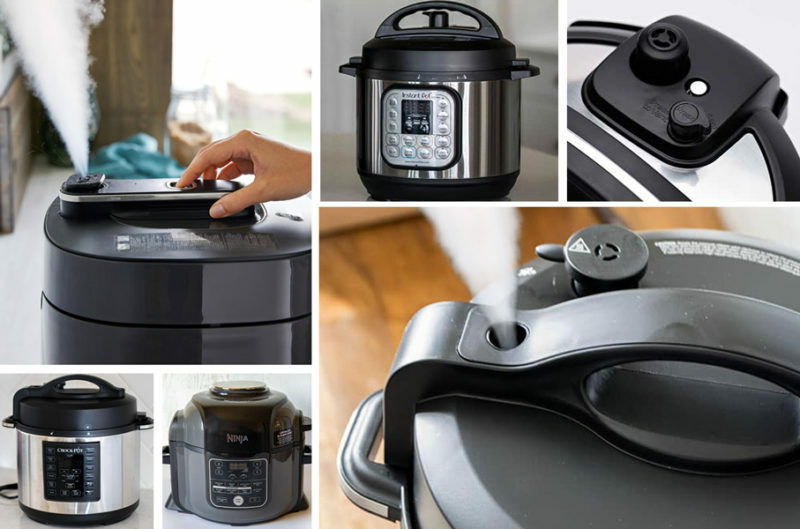 What are the pros and cons of electric vs. stove top pressure cookers? Thanks Barbara-some really helpful information on the difference between the 2 releases. When converting a recipe to the pressure cooker, I’m usually stumped as to how long to wait with the natural release….good to know a 10 minute release works good. I know I’ve waited quite a chunk of time to let the thing release on its own some times.